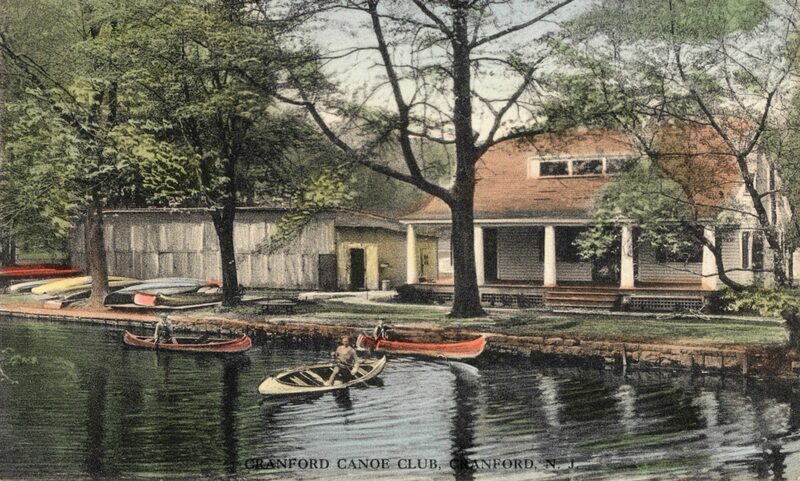 The Cranford Canoe Club is one of the oldest canoe clubs in the United States and a community landmark known as part of Cranford’s identity for over 100 years. The current canoe club, while not the first, is the Rahway River’s last surviving canoe club. The dock at the Canoe Club which has served Cranford for over 100 years. Cranford was incorporated as a township by an act of the New Jersey Legislature on March 14, 1871, from portions of the Townships of Clark, Linden, Springfield, Union and Westfield. The Rahway River is a slow moving meandering centerpiece of the town that has both enriched and terrified residents. Cranford’s nickname is the “Venice of New Jersey”. due to the canoeists paddling along the Rahway River that meanders through the township. Nonetheless, it is a fabric of the community and there has always been an interest in water sports on the river. 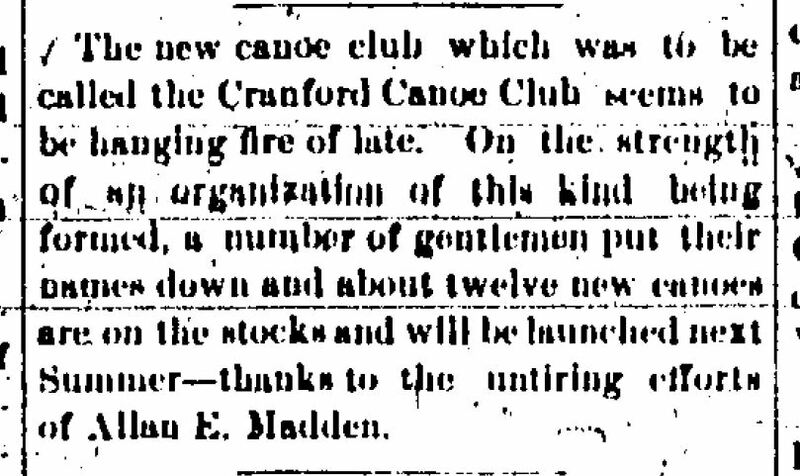 While the original thought is that the Cranford Canoe Club was a physical building, that was not the case. When you think of the Cranford Canoe Club you have to think of it like a club. The CCC has resided at various locations that are highlighted. The Cranford Canoe Club resided in three locations; Normandie and Springfield Avenues, Springfield Avenue, and it’s last location on the corner of Springfield Avenue and Orange Avenue. The Cranford Canoe Club has gone through numerous club presidents and later as private owners and is now owned by the Township of Cranford. While no longer a “club”, the facility is located on the corner of 250 Springfield Avenue and Orange Avenue. There are maps that show another Cranford Canoe Club across the street in 1922 and there are various references that originate the Canoe Club in 1908 and 1907 while other documents date the club back to 1886 so we continue to dig. In the late 19th century Cranford saw the formation of many informal boating/hockey clubs by its young men. The Cranford Canoe Club had its origins in the “Shanty Gang”which held meetings in A. Clark’s red “Lobster Shanty” canoe livery at the intersection of Normandie Place and Riverside Drive. In 1904 or 1906 the Shanty Gang renamed themselves the Skeeter Club. In 1908 the Skeeter Club formalized itself as the Cranford Canoe Club. Beginning in the 1880s, the Cranford River Improvement Association/Club (CRIC) and other Cranford organizations held various water carnivals and regattas on the river. According to an 1886 New York Times article, the carnival’s decorations illuminated the night: “nearly a hundred boats will be gaily decorated with sky lanterns, the river banks will be illuminated with colored lights, the bridges will be lit up, there will be bands of music and a display of fireworks.” Novelist Robert Ferro described these carnivals in his 1983 novel The Family of Max Desir, centered on a fictionalized version of the river. At the Cranford River Improvement Association’s first parade held from July 31-Aug 2, 1886 holding its first regatta at the Cranford Boating Club followed by a water carnival. In the early 20th century there was a concerted effort by Americans to expand their recreation activity and spend more time outdoors. 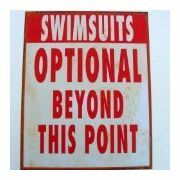 Organizations like the YMCA and parks were formed for recreational activities. Canoeing became popular because the Rahway River was a quiet slow moving river which was ideal for recreational canoeing. 1906 Advertisement from the Cranford Chronicle for Lobster House selling Old Town brand canoes. What is believed to be the 2nd Cranford Canoe Club (C.C.C.) (across from today’s C.C.C.) had a clubhouse and sold memberships. Members did not have to reside in Cranford but most did. Members typically met on Friday nights to discuss activities. C.C.C held their inaugural river regatta in 1906. At the second regatta on Saturday, July 27, 1907, there were multiple canoe clubs participating including the Skeeter Canoe Club from just up the street (Cranford), the Passiac Canoe Club, The Ulhigh Canoe Club across the street (Cranford) and others. Events included Women’s winner Miss Bessie Merriam who won a canoe back rest. Men’s winner Alfred Clark, president of the Skeeter Canoe Club of Cranford won a paddle. The early Cranford Canoe Club shown on the 1922 map is later known as the Girl Scout House, and the Cranford Canoe Club moves across the street to its current location which was originally built to support the Ulhigh Canoe Club. At the CCC on June 5, 1908 a motion was passed “that flag memberships be established, flag members have the right to carry the club flag and to have the use of the club grounds, the racks and lockers for the storage of canoes and fittings.” During the same week, the club docks and racks were completed and a rustic veranda was started. Cranford Historical Society trustee Robert Fredlington says the Cranford Canoe Club was “the cream of the bunch,” and moved into the current building, formerly owned by the Ulhigh Canoe Club, in 1934. In the spring of 1908, the Ulhigh Canoe Club building at 250 Springfield Avenue was erected and completed around May 15, 1908. . At 2pm, most likely on Saturday, May 30, 1908 (reported June 4, 1908) Ulhigh President Leeds of the club introduced H.H. Drake of Elizabeth who made an address reciting the club’s history. Edwin O. Woodling gave the club a hearty welcome and every assurance of public support. A club pennant was presented; a brown and white flag with the initial “U” inscribed in an embroidered triangle. A regatta followed on July 4th with a loving cup presented to each winner. Prizes for the July 4 event, including the trophies and a bathing suit were put on display at Reay’s Drug Store. The canoe clubs from Cranford were competitive outside Cranford as well. In 1909, at the Hudson Fulton Regatta hosted by the Yonkers Canoe Club, both the Cranford C.C. and the Ulhigh C.C. participated . In the tandem single blade race, Cranford C.C’s W.H. Wagstaff and L.L. Coudert came in 2nd overall while Ulhigh C.C. members J. Smith and W. Anderson came in 6th. In the “Club Fours” competition, Cranford C.C. members W.H. Wagstaff, L.L. Coudert, W. Drysdale and D.L. Dagget came in fourth overall. The markings on the map above shows across from the current canoe club was also the Cranford Canoe Club, known later as the Girl Scout House. The location is now a public park. The Canoe Club at the current location (250 Springfield Avenue) is the one that is stated as being the older (on Cranford maps going back to 1908). The 1906 ad to the right from the Cranford Chronicle shows the Lobster House Canoe Club selling Old Town brand canoes. In 1907 is was reported that C.Garner, Eric Anderson and Ernest Anderson started a canoe voyage that commenced August 12, 1907 at the Lobster House on the Rahway River, around the Raritan Canal, with Philadelphia being their final destination. The trip took one week. In 1917 the Cranford Canoe Club consolidated with the Casino Canoe Club. 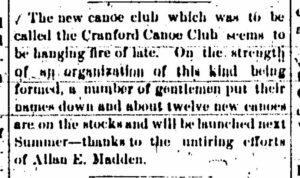 On February 28, 1924 the Cranford Canoe Club burnt down. 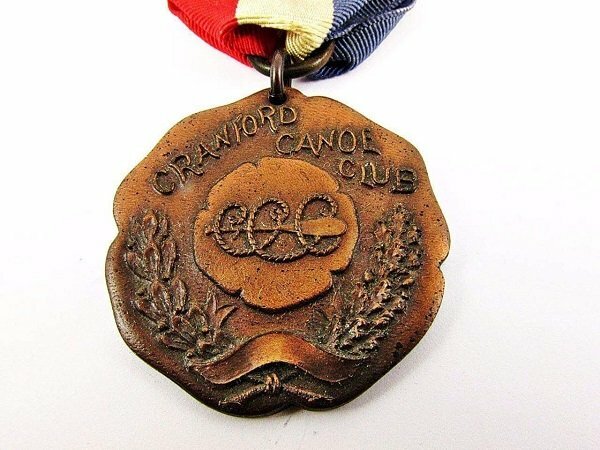 In September, 1924 the newly designed Cranford Canoe Club was completed. The club also built tennis courts behind their new club house. 1915 – Ulhigh private canoe club, built in 1908 that later became the Cranford Canoe Club. The original structure seen here is still there today and still serves as Cranford’s only remaining canoe rental operation. On November 8, 1934 the Cranford Canoe Club began renting their club house to the Cranford Girl Scout Council which renamed it the Neva Sykes Girl Scout House. In 1939, C. J. Collins of 10 Balmiere Parkway in Cranford, owned the Ulhigh Canoe Club at Springfield and Orange avenues. Mr. Collins took over the canoe club in 1915. The club got its name from an Indian word meaning “Crescent Moon” and started as a private canoe club in 1908. Members held races against the now defunct “Cranford Canoe Club” which at the time had been located across Springfield Avenue in what is known today as “Girl Scout Park”. In 1966, the available Rahway River voyager route for the Cranford Canoe Club visitor. “There are from two to three miles of river available for canoeing at present. Starting from the Ulhigh Canoe Club, one could paddle under the Springfield and Eastman Street bridges, around the bend at MacConnell Park, under the second Eastman Street bridge, past Hampton Hall, under the second Springfield Avenue bridge and through the Normandie Park section. Some have gone as far as Kenilworth. The Ulhigh Canoe Club had 19 canoes in 1939, once owning as many as 50 in its heyday. The property and facility across the street later changed names to the Neva Sykes Girl Scout House. The house was demolished in November 1964. There are no visible remnants of the original Cranford Canoe Club (C.C.C.) facility that would have been next to the today’s Town clay tennis court facility. The first location for the Cranford Canoe Club. Late 1800’s – The Cranford Canoe Club had its origins in the “Shanty Gang” which held meetings in A. Clark’s red “Lobster Shanty” canoe livery at the intersection of Normandie Place and Riverside Drive. 1906 – First regatta sponsored by C.C.C. 1904 or 1906 – the Shanty Gang renamed themselves the Skeeter Club. 1910 – The Cranford Canoe Club bought property on Springfield Avenue (across the street from the Uligh Canoe Club, site of the current Cranford Canoe Club, and built a club house furnished in Mission style oak furniture and a player piano. 1924 – the newly designed Cranford Canoe Club was completed. The club also built tennis courts behind their new club house. 1934 – Cranford Canoe Club relocates across Springfield Avenue to 250 Springfield Avenue. 1945 – In February, 1945, Cranford Township took title to the Club house in lieu of $875 in unpaid taxes. Club Pennant – A brown and white flag with the initial U inscribed in an embroidered white triangle. 1908 – Built and founded Ulhigh Canoe Club – At Decoration Day Ulhigh C.C. President Leeds hosted the opening celebration. Club Captain was C.A. Gardner. 1934 – Cranford Canoe Club moves across street – Ulhigh Canoe Club closes. “New York Times”. New York Times. March 8, 1992. Images of America: Cranford. Arcadia Publishing, Dover NH. 1995. p. 18. Fridlington, Robert (1995). Images of America: Cranford Vol. II. 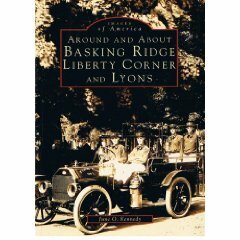 New Hampshire: Arcadia Publishing, Dover NH. p. 17. “Cranford Canoe Club”. Cranford Chronicle. November 6, 1895. “Cranford parades and festivals on the Rahway River” (PDF). Bragdon, William (1937). Cranford – An Outline History. The Cranford Chronicle”. Cranford Chronicle. November 10, 1900. “Historic District proposed for Cranford’s ‘Little Venice”. Newark Star Ledger. October 28, 2010. “Cranford Club Races” (PDF). Cranford Chronicle. 1907-08-01. “Canoe Club News” (PDF). Cranford Chronicle. 1908-06-08. “NJ Monthly: Canoe Club Among Best in State”. “Canoe Locals News” (PDF). Cranford Chronicle. 1908-04-30. “Canoeing Hudson Fulton Regatta”. Forrest and Stream Vol. 73. 73. October 16, 1909. “Cranford Map c1911”. New Jersey Digital Highway. 1911. “Cranford Locals Paddle from Cranford to Philadelphia” (PDF). Cranford Chronicle. 1907-08-15. Fridlington, Robert. Cranford, New Jersey (Images of America Series). Arcadia Publishing. “Cranford Canoe Club Consolidates with Casino”. Cranford Chronicle. May 24, 1917. “Cranford Canoe Club Burns in Blaze”. Cranford Citizen. February 28, 1924. “Neva Sykes Girl Scout House”. Cranford Chronicle p.1. November 8, 1934. “Renewed Interest Locally in Canoeing this Season” (PDF). Cranford Chronicle. August 3, 1939. “Advertisement”. Cranford Chronicle Newspaper. May 1, 1908. “Girl Scout Movement Enjoys Rapid Growth in Cranford” (PDF). Cranford Chronicle. July 1, 1948. “Cranford Township purchases Canoe Club”. Cranford Chronicle. February 8, 1945. LIPPMAN COLLINS, Helen (May 31, 1987). “Something for Everyone in a Canoe”. New York Times.